After a busy week in Brussels we returned to the UK unloaded the van and loaded it straight back up ready to head off on our next exhibition stand build at the NEC in Birmingham. 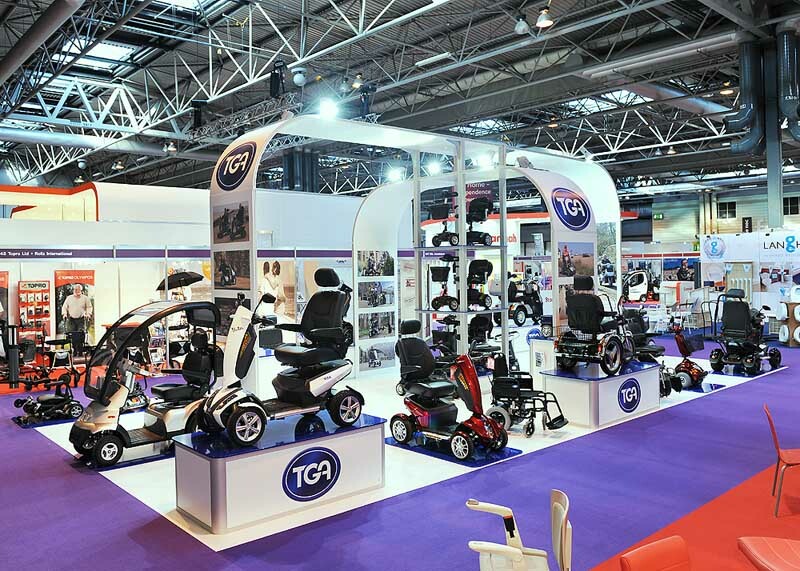 This year was the start of a new 3 year contact with our new client TGA and the first show they exhibited at with our newly designed hire stand was Naidex National. 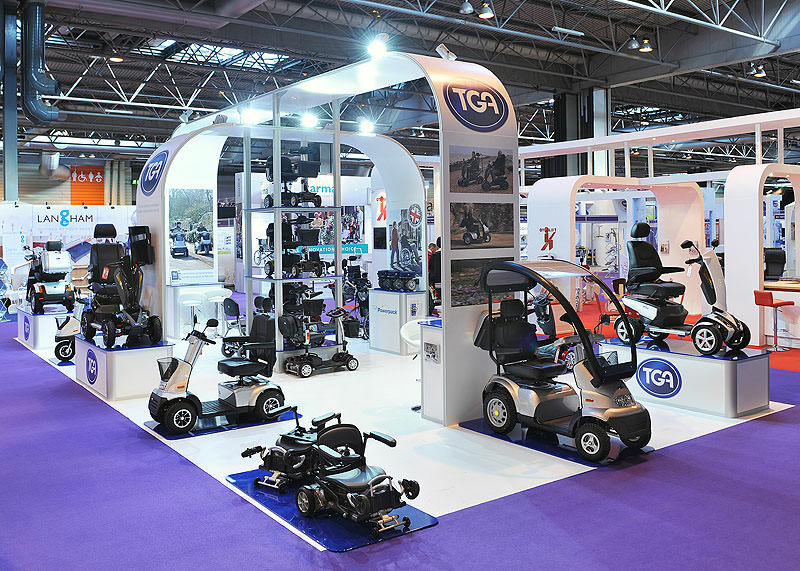 TGA specialise in mobility equipment which they supply in the UK and worldwide. Naidex being the UK’s largest disability, homecare and rehabilitation event is the perfect place for them to showcase their products and this year launch their new Minimo mobility scooter. Having kept our new exhibition stand design under wraps until TGA launched it at their first show we are now pleased to show you what you can do with a 12m x 6m stand space. Designed so the stand can be easily reconfigured to fit the larger stand space of 12m x 9m that the client has booked for their next show, the stand uses our huge range of hire stock with added custom made plinths for showcasing the clients vast range of mobility scooters. The plinth tops were all spayed to match the client’s corporate logo colour to make everything tie in nicely together. TGA had a very successful show with the launch of their new stand and the new Minimo mobility scooter “Daniel Stone, TGA Managing Director commented: “Coinciding with the successful first appearance of our redesigned stand, Naidex National has once again been a success for TGA thanks to the launch of our Minimo.” More on TGA’s success at the show and detail on the Minimo Scooter can be found here http://www.tgamobility.co.uk/2013/05/07/new-pioneering-and-folding-tga-minimo-mobility-scooter there is also a great team shot of the staff on their stand.